The Verbatim Contour Series 3000K, R20 LED lamp is a high-quality, energy efficient replacement for halogen flood lamps. Contour Series R20 LED lamps maximize the surface area of the heat sink - without visible heat sink fins. 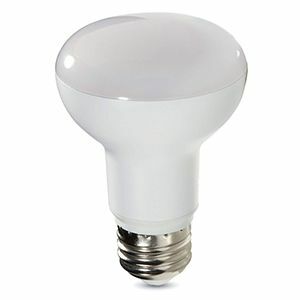 The result is a smooth, white, streamlined exterior that closely resembles the appearance of traditional halogen R20 bulbs. Suitable for both commercial and residential settings, the wide flood light distribution of Verbatim R20 LED lamps is ideal for track fixtures and downlights where softer illumination is preferred. ENERGY STAR qualified, the 3000K R20 LED lamp has a long lifetime, resulting in reduced maintenance and replacement costs when compared to halogen lamps.